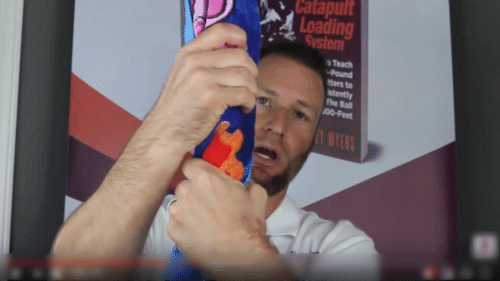 What he IS doing with Catapult Loading System comparing righty v. lefty swings. 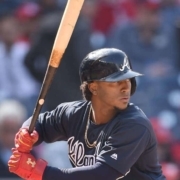 Compared to other Woolly Mammoth hitters in the league like Aaron Judge or Giancarlo Stanton, Ozzie Albies stands at a vertically challenged 5-foot, 8-inches tall, and weighs only 165-pounds! Jose Altuve may come to mind? If so, then check out this post titled, “Jose Altuve Hitting Analysis Reveals A Pathway To Repeatable Power”. 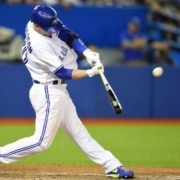 Locking out front knee at impact on every swing. Look, if you want the biggest bang for your buck when it comes to consistent power, then don’t look for it in the legs. The legs are only 20% of the power game. The other 80% is found in the spinal engine. Don’t believe me? 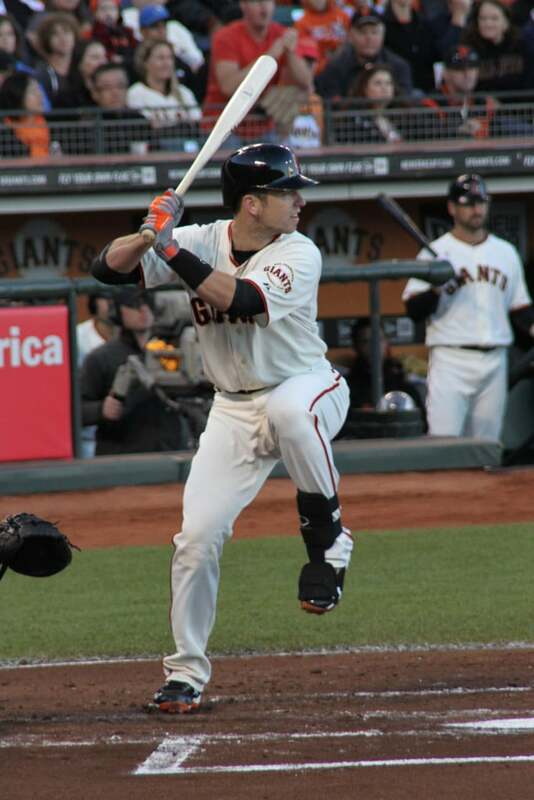 Then check out this post titled: “Is Rotating Back Hip Through The Zone Necessary For Power?” I tell my hitters, your spine engine gets you to the wall, and your legs get you over. Not ‘hiding his hands’ from the pitcher. ‘Hiding hands’ from the pitcher like a champ! The Plate Appearances are definitely not equal, so we’ll see what happens by the end of the season. 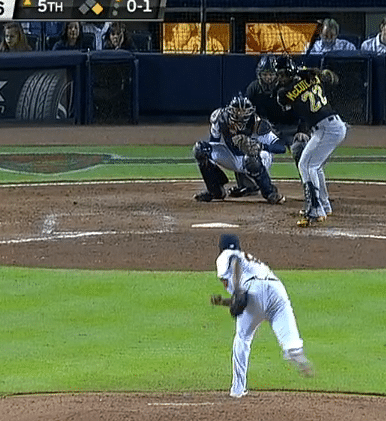 But my fear is, if Ozzie Albies doesn’t change the relationship of the Catapult Loading System to his lefty swing, he’ll see more right-handed pitchers. 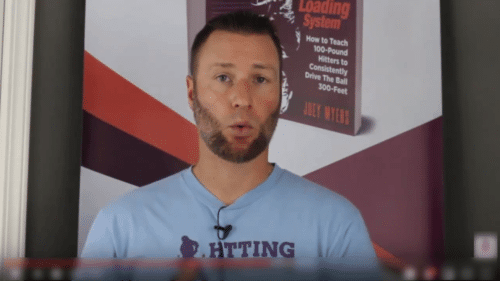 Want To ADD Between 25 to 40-Feet Of Batted Ball Distance? 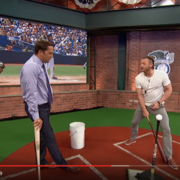 Question: Is Increased Bat & Ball Exit Speed ALL in the Hips? Using the Zepp (Labs) Baseball app , I wanted to use the Scientific Method to analyze whether ‘Showing the Numbers’ to the pitcher is more effective than ‘NOT Showing’ them when it comes to measuring Bat and Ball Exit Speeds. In this swing experiment, I had professional hitter of mine that I’ve been working with for a few months, Preston Scott, do the hitting. I’m revisiting an earlier experiment I did, looking into whether power was ALL in the hips. You can CLICK HERE to read and watch the experiment findings. 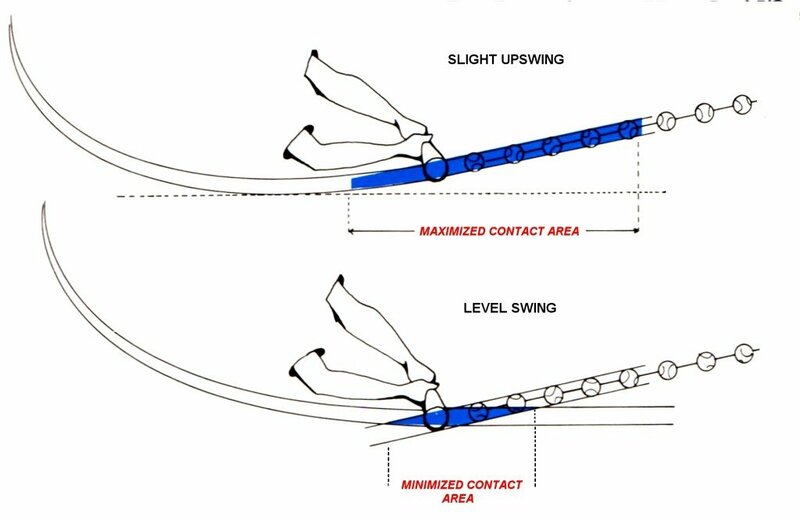 Not to beat the springy fascia horse, but you can get more background information on why this swing experiment turned out like it did by reading through the following video blog posts. 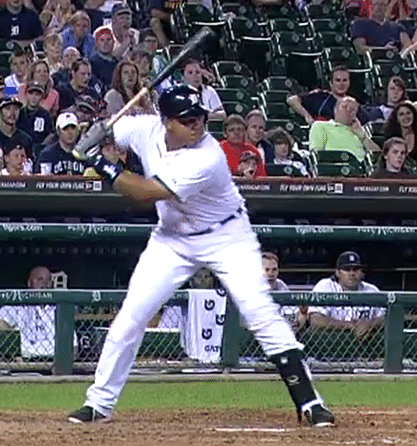 Miguel Cabrera and the timing of torque. Adrian Gonzalez: how-to naturally spring load the body. From the research into Anatomy Trains (Thomas Myers), The Spinal Engine (Dr. Serge Gracovetsky), and from my past swing experiment, I expect to see similar results…maybe even slightly lower numbers favoring ‘Showing Numbers’. I say slightly lower numbers because in the first experiment I didn’t counter-balance the swings. In other words, I took 100 consecutive swings ‘NOT Showing Numbers’ first, then took another 100 consecutive swings ‘Showing Numbers’. This may have caused a “getting tired” or “not warmed up yet” effect, therefore biasing the experiment results. Professional Preston Scott taking the swings, not me. I used two yellow dimple ball markers to make my stance setup consistent…one was placed inside my back foot, close to the plate. The other was placed one bat’s length ahead of the back marker. 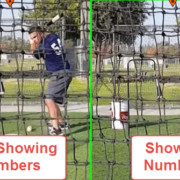 The two tests in the swing experiment were counter-balanced. Which consisted of eight blocks of 25-swings done in the following order ABBA BAAB. ‘NOT Showing Numbers’ was letter ‘A’, and ‘Showing Numbers’ was letter ‘B’. 200 total swings were completed in the experiment, 100 per test. Counter-balancing helps remove the “getting tired” and “warm up” factors. On ‘NOT Showing Numbers’ swings, Preston kept his shoulders in line with the blue band on the ground in front of him (towards the pitcher). 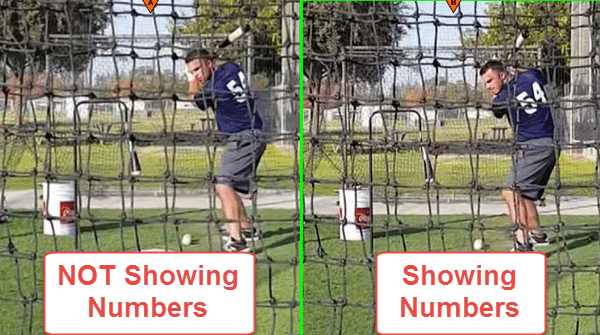 And on ‘Showing Numbers’ swings, he kept his shoulders in line with the red band that was set at about a 30-degree angle from the blue band. Preston Scott was sipping a protein shake throughout the length of the experiment to aid in recovery. On both experiment days, Preston had finished “leg day” at the gym, so our warm-up was brief, followed by about 15-20 swings off the tee. We had to break the 200 total swings (4 sets of 25 swing chunks each day) into two days, with the second day coming 1 week later because of time constraints. 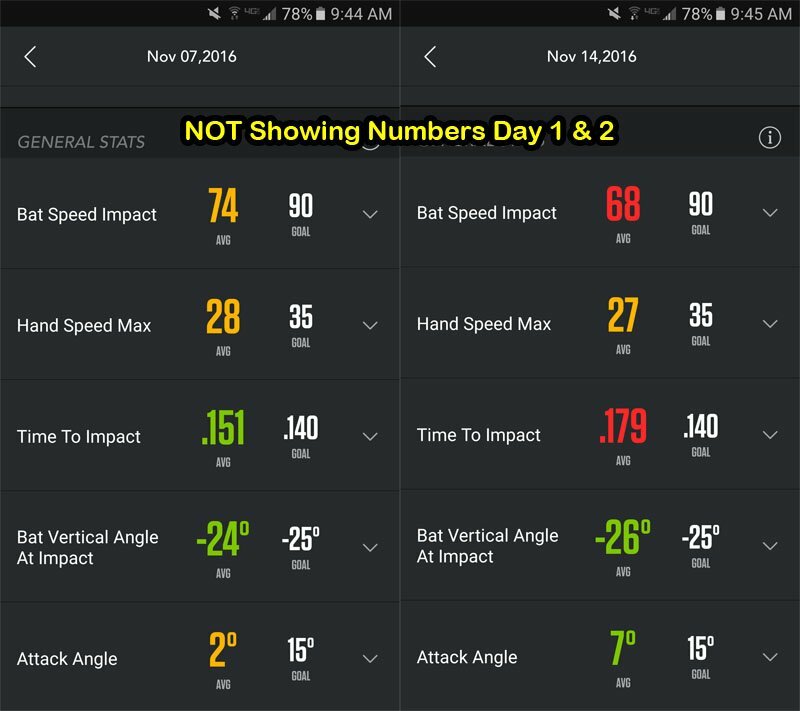 It’s important to note, Preston and I were working on improving his mechanics slightly different both days (having nothing to do with ‘showing numbers’), but even though Day 1 (November 7, 2016), and a week later, Day 2 (November 14, 2016) swings may look a bit different, the slightly differing mechanics were used for BOTH ‘NOT Showing Numbers’ and ‘Showing Numbers’ tests, so as not to muddy the experiment results. Also, CLICK HERE to access the Google Drive spreadsheet with all Ball Exit Speed (BES) readings from the experiment. Translates between 5.2-feet to 7.8-feet of EXTRA batted ball distance – depending on if you calculate using 1-mph BES = 4-feet of distance OR 1-mph BES = 6-feet of distance. In this experiment, if you look at the ‘NOT Showing Numbers’ swings, they were actually ‘Showing Numbers’. In other words, Preston already shows his number to the pitcher well causing him a challenge to not show them. Therefore on the ‘Showing Numbers’ swings, he showed them more. 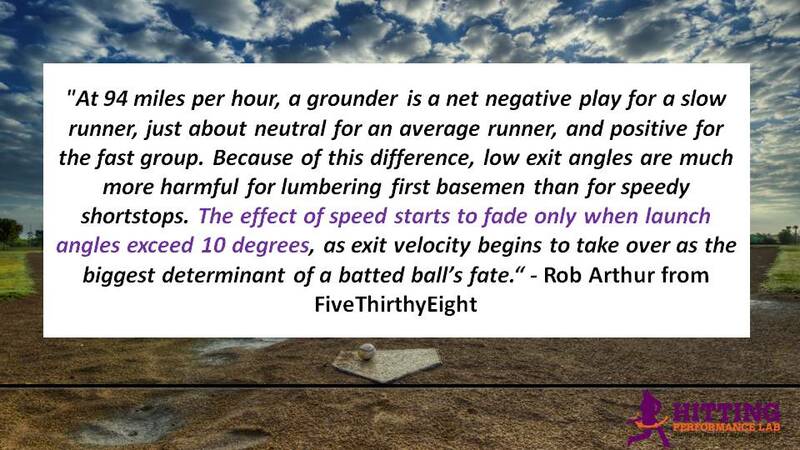 I think that’s why we didn’t see as much of a difference in Ball Exit Speeds. One of the big objections from some is that ‘Showing Numbers’ causes an increase in Time To Impact. These results show it doesn’t – it actually decreases Time To Impact. WHY is this? It has to do with ‘taking slack out of the system’ as it relates to compression/tension forces acting within the body. Preston Scott generally does a great job of ‘Showing Numbers’, even before I started working with him, so he felt like he really had to try and keep from pulling the ball too much when ‘NOT Showing Numbers’. And as you can see in the video, he was still ‘Showing Numbers’ somewhat, even when he wasn’t suppose to! 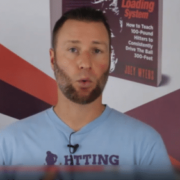 https://hittingperformancelab.com/wp-content/uploads/2016/12/not-showing-versus-showing-numbers-experiment2.png 335 600 Joey Myers https://hittingperformancelab.com/wp-content/uploads/2018/05/hitting-performance-labs_c90c0362088ef1d3d528f3078f4f8ac1.png Joey Myers2016-12-09 04:04:412018-07-23 20:41:56Want To ADD Between 25 to 40-Feet Of Batted Ball Distance? 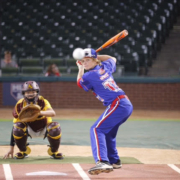 …Did You Catch The Performance Of The Small Slugger That Beat Blaze Jordan? 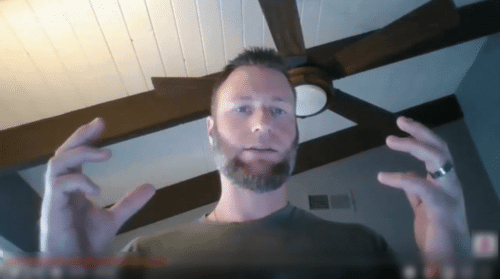 Well, did you hear about the small-bopper who gave Blaze Jordan a run for his money? By the way, Blaze Jordan stands in at 6-Foot tall, and 217-Pounds. And the preceding Blaze Jordan profile link may be a year or two old! 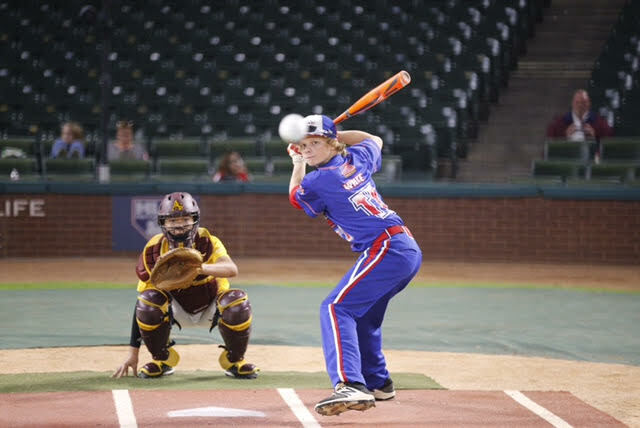 You can see Hudson “The Hawk” White is exemplifying the Catapult Loading System: ‘showing numbers’, ‘down shoulder angle’, & ‘hiding hands’. Photo courtesy: Hudson’s father Marty. Broke world record with 11 consecutive home runs in a row . High school fences set up. Normally a lead off 1,2 hole on nationally ranked teams. Didn’t think he could hang with all the 6’2″ 180 lb 15 year old 4-hole hitters there. I didn’t work with Hudson White…his dad did…using the Hitting Performance Lab repeatable power formula. Marty is just one of the hundreds of coaches getting the same results, if not better, than I am with my own hitters – using the same process!! So, it’s not just me, or that maybe I’m “Tony Robbins” special. Please do Hudson, Marty, and HPL a favor and PLEASE SHARE THIS post on your favorite social media networks…Facebook, Twitter, LinkedIn, YouTube, Instagram, etc. This stuff works folks. We’re producing hitters that are consistently tripling their body-weight in batted ball distance. “…This year he was a freshman on varsity at Byron Nelson High School. He was starting 2nd and 3 hole. He led all north Texas in hits most of the season and finished 7th overall with 45. He was hitting the ball hard somewhere! Hudson was named District 5-6A Unanimous Newcomer Of The Year and All – Area Newcomer of the year finishing 7th in area with 45 hits, 25 RBI, 21 runs , 16 SB. 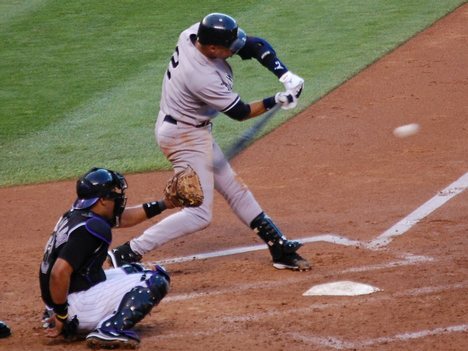 The MYTH that rotating the back hip through the zone is necessary for power. 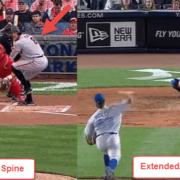 Which brings me to the above video, where Coach Matt Nokes walks us through numerous examples of elite hitters not fully rotating their back foot (and pelvis) until after impact. Full pelvic rotation is getting the hitter’s belly button to face shortstop (for a righty, or 2B for lefty) on any pitch…inside, middle, and outside. I’ve found this gospel preached from those who don’t ‘buy into’ or understand the loading of springy fascia in the torso, since to them, the shoulders would be seen as ‘inactive’, before the hitter starts turning. Therefore the pelvis has to do all the heavy lifting. WILL continue to keep Orthopedic surgeons in business. 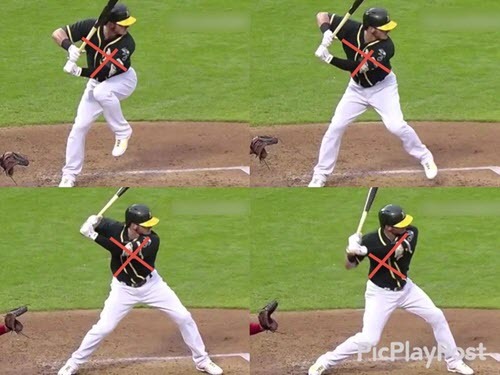 CLICK HERE for a post I did explaining how the swing isn’t rotational OR linear, but that’s it’s actually linear, rotational, then linear again. The objective of this presentation was to give a technical speech to a non-technical audience. 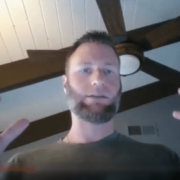 Sorry, the video and audio aren’t the best, but I think you’ll get the overall message. Also, I’ve provided the powerpoint slides I used for this presentation (CLICK HERE to download from Google Drive). You may find it quite helpful to follow along with the slides during the presentation. PLEASE NOTE: in each section, I do skip to the images in that section to help illustrate a point. 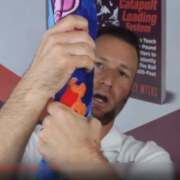 Knock snot out of the ball with Springy Fascia. 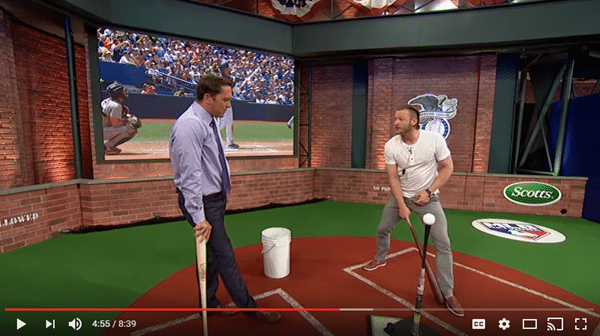 Question: Does Having a ‘Hunched Posture’ Boost Bat Speed Over NO Hunch? There are many more, especially in the 1960’s and ’70’s. 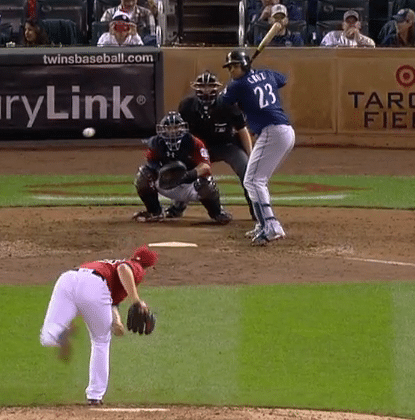 These hitters/pitcher either start with the ‘hunch’ or move into it before they start turning. For the science, I recommend you read Dr. Serge Gracovetsky’s book The Spinal Engine . I will go over a few talking points about the Posterior Ligamentous System (or PLS). Think of the PLS as a connective tissue harness you’d use to scale down a large building. In Dr. Gracovetsky’s aforementioned book, I’d like you to read under the subheading “Lifting While Lordosis Is Maintained” p. 82., and nd “Lifting While Lordosis Is Reduced” on p. 83. I’m paraphrasing, but Dr. Gracovetsky says when the bend in the lower back is maintained (NO hunch), then we’re using a “muscle-predominant strategy”, and when the lower lumbar curve is taken out (hunch), then we’re tapping into the “muscle relaxation response”. What Dr. Gracovetsky found in his research and study was that when a person picks something up from the ground that is heavier than we’re used to picking up, the back will round (hunch), muscles will turn off, and the PLS system will kick in. You can experience the two systems (muscle v. ligament) by trying to see how long you can sit up straight in your seat…once your muscles get tired, then you’ll take on the hunched posture, letting the PLS take over. This is why it’s so comfortable to sit slouched, and hard work to ‘keep your back straight’. The reason for this ‘spinal safety net’ as Dr. Serge Gracovetsky alludes to, is to put the vertebrae of the spine into a safer position, also known as decompression. My friend D @SelfDecompress on Twitter is doing just this with his clients. 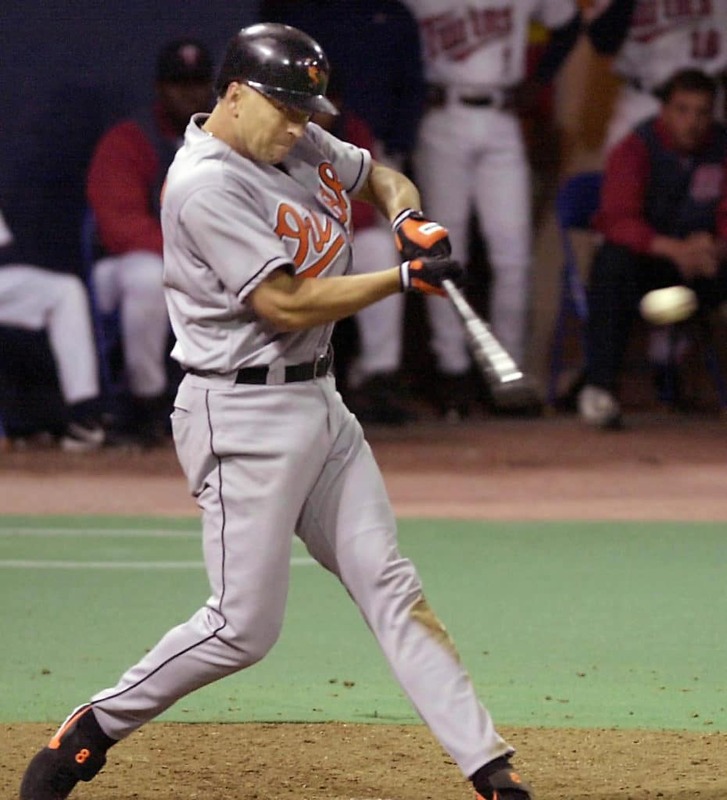 CLICK HERE and read under the sub-heading “The Hitting ‘Governor'” in this HPL article about how our brain puts a limit on performance because of movement dysfunction. 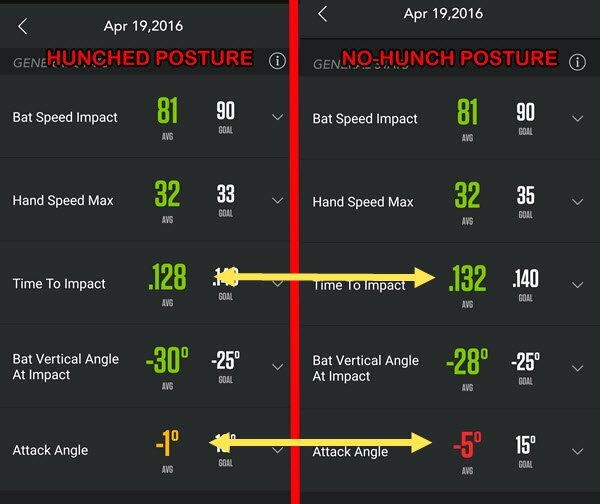 Based on Dr. Serge Gracovetsky’s research and study, it is my forecast that taking on a ‘hunched posture’ before the turn, will increase average bat speed over not hunching. I also add the same results is because of the information I included under ‘The Hitting Governor’ sub-heading in the aforementioned HPL article. 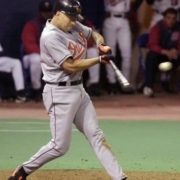 In other words, by hunching the back, thereby decompressing the vertebrae of the spine, we remove ‘The Hitting Governor’ Effect, and allow the body to optimize turning speed. Not to mention we make the swing safer for our rotating athletes’ bodies. 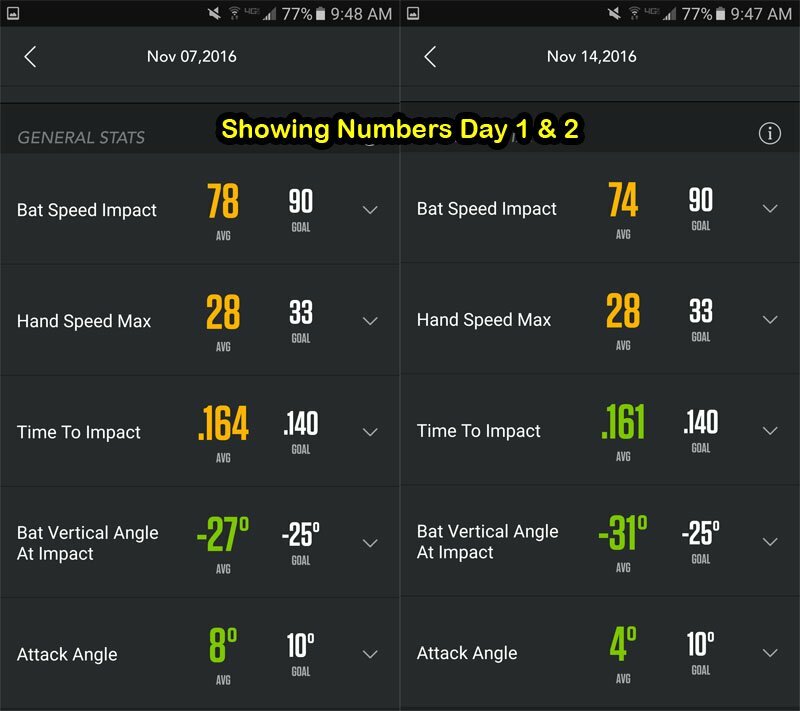 We used the Zepp Labs Baseball app to gain swing data. Our concern is for an apples to apples comparison between the two sets of 100 swings. 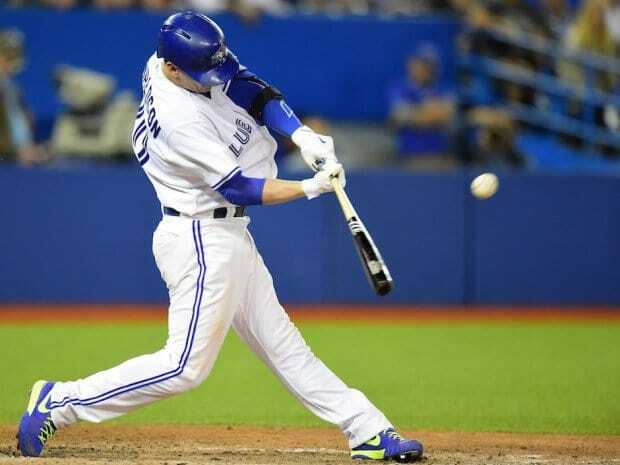 All swings for the baseball hitting drills off tee ‘hunched posture’ experiment were taken off a Backspin batting tee. I stayed as consistent as I could with keeping the ball height and depth the same for most swings. I used two yellow dimple ball markers to make my stance setup consistent…one was placed inside my back foot, close to the plate. The other was placed one bat’s length plus two baseballs in front of the back marker. 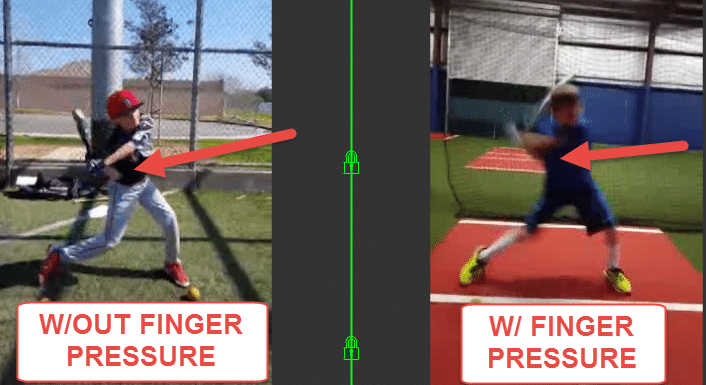 The two tests in the baseball hitting drills off tee ‘hunched posture’ experiment were counter-balanced. Which consisted of eight blocks of 25-swings done in the following order ABBA BAAB. ‘Hunched posture’ was letter ‘A’, and ‘NO hunch’ was letter ‘B’. 200 total swings were completed in the experiment, 100 per test. Counter-balancing helps remove the “getting tired” and “not being sufficiently warmed up” factors. Throughout the baseball hitting drills off tee swing experiment, I was drinking a Strawberry Lemonade Gatorade (because I like it!) and a chocolate milk to replenish my body’s protein, sugars, and electrolytes during the 2-hour experiment. I did an 8 exercise dynamic warm up before taking about 15-20 practice swings off the tee. A more POSITIVE barrel Attack Angle, which puts a hitter into a better position to hit more consistent line drives.